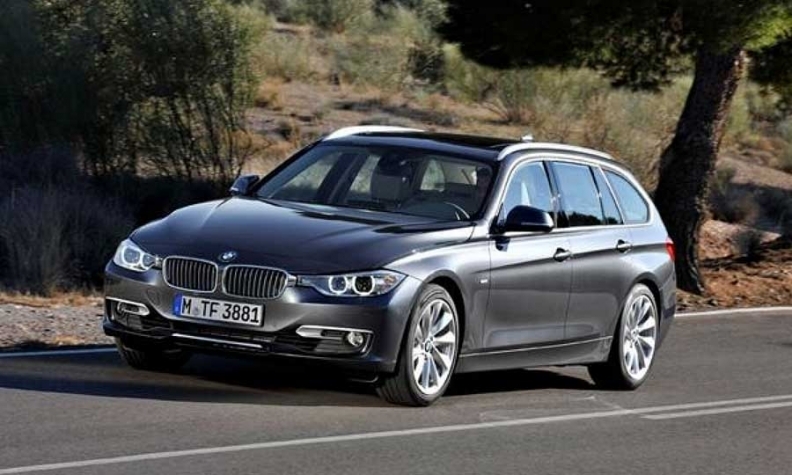 In line with its sedan sibling, the new 3-series wagon has grown in size. Length is up by 3.7 inches at 178.2 inches, while height increases by 0.4 inch to 56.3 inches. BMW has revealed the wagon version of the fifth-generation 3-series. The company says that the new 3-series Sports Wagon, known as the 3-series Touring in Europe, will reach U.S. showrooms about a year from now. Following the example of previous generations of the 3-series wagon, the new model places greater emphasis on styling appeal than load-carrying ability, adopting an extended roof and an angled rear window in the mold of the larger 5-series wagon. The adoption of new underpinnings has brought about increases in accommodation, with BMW touting greater rear-seat legroom and load-carrying capacity. Details pertaining to the U.S. version have not yet been made official. But it is likely that the new 3-series Sports Wagon will come with the same gasoline engines used in the latest 3-series sedan, including a turbocharged 2.0-liter four-cylinder with 240 hp and 260 lb-ft of torque and a turbocharged 3.0-liter inline six-cylinder with 300 hp and 300 lb-ft. In line with its sedan sibling, the new 3-series wagon has grown in size. Length is up by 3.7 inches at 178.2 inches, while height increases by 0.4 inch to 56.3 inches. The car also rides on a new platform, with a 2.0-inch longer wheelbase at 110.6 inches, while the front and rear track widths are up by 1.5 inches at 60.7 inches and 1.9 inches to 62.3 inches, respectively. With 17.5 cubic feet beneath its luggage cover behind the rear seats, the new 3-series wagon boasts a nominal 1.2 cubic feet more load space than the fourth-generation model. Maximum luggage space has increased by 4.1 cubic feet to 53.0 cubic feet, giving it 2.5 cubic feet more than the Audi A4 Avant and the same capacity as the Mercedes-Benz C-class wagon when the rear seats are folded. BMW has retained the handy separately opening rear window, which allows you to put smaller items in the rear without the need to open the tailgate. The height of the loading lip has also been lowered slightly, to 24.4 inches.